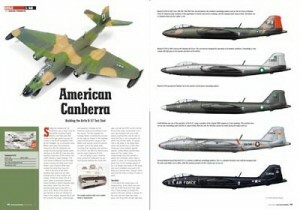 One of the great features of the October issue of the SAM magazine was article about the American version of the well known British jet bomber Canberra. Article is made by David Francis and it is model build of the 1/48 scale models manufactured by Airfix. Article and model build is nicely done and from my side I have arranged two pages of the color profiles for this article. With total of ten profiles I have present planes operated by USAF, Pakistan, South Vietnam, Nationalist China and NASA. Several interesting camouflage pattern are shown there and this profiles are published on pages 959 and 960. The Martin B-57 Canberra was a twin jet engine, light bomber and reconnaissance aircraft (photographic, electronics, and meteorological) which entered service in the 1950s. Originally based on the British English Electric Canberra, the US-built B-57 had evolved into several unique variants. Great aircraft, had the AIrfix 1/48 model for about a year, so I think I better get started on it.